The University of Oxford’s Bodleian Libraries has acquired a rare 15th-century French Gothic coffer – one of the largest-surviving examples of a late medieval box used for transporting precious books. The price has not been disclosed but the chest was offered in a Pierre Bergé auction in Paris in November 2007 with an estimate of €40,000-50,000. It was bought for an unknown sum by specialist manuscripts and medieval art dealership Les Enluminures, which has now sold it to the Bodleian. The coffer went on view in Oxford this week as part of a display at the Bodleian’s Weston Library called Thinking Inside the Box. The display features bags, books and carrying cases that have been used to transport books through the ages. Oxford Internet Institute has created an impressive responsive ‘3D’ online model of the object that can be viewed below and also on its Cabinet website. 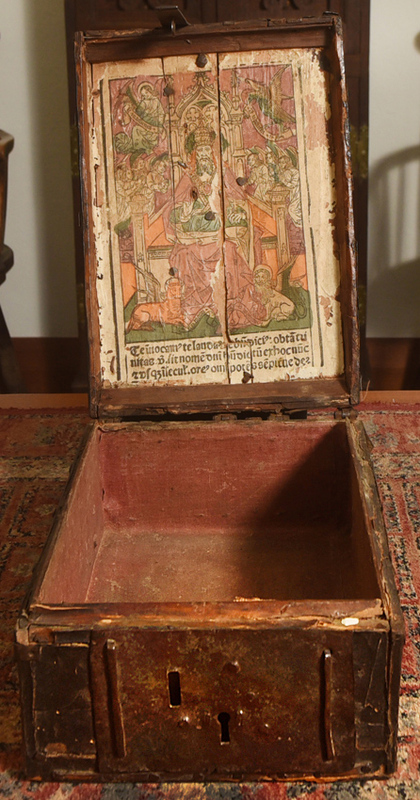 While thousands of manuscripts and printed books survive from medieval Europe, only around 100 of this type of book coffer are known to still exist. 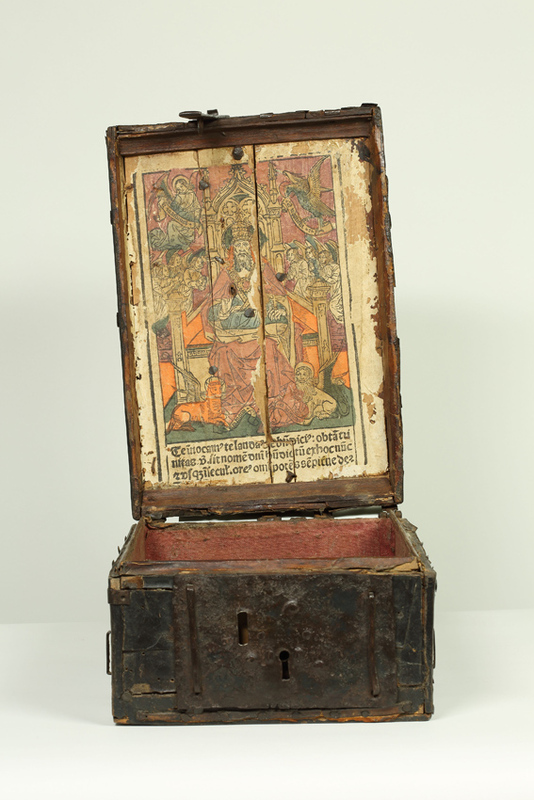 Most of them date to the 1500s and contain woodcut prints attached to the inside of the lid, suggesting that they may have been used as travelling altars as well as for carrying valuable books. The example bought by the Bodleian contains a vividly coloured but fragile print depicting ‘God the Father in Majesty’. Only four impressions of this woodcut are known to survive, dating from the earliest days of printing in Europe. The image is derived from an earlier work printed in Paris in 1491 which was created for a Missal (the book containing texts used in Catholic Mass) by the Master of the Très Petites Heures of Anne of Brittany. The Bodleian’s 500-year-old coffer is made of wood and is covered in leather. 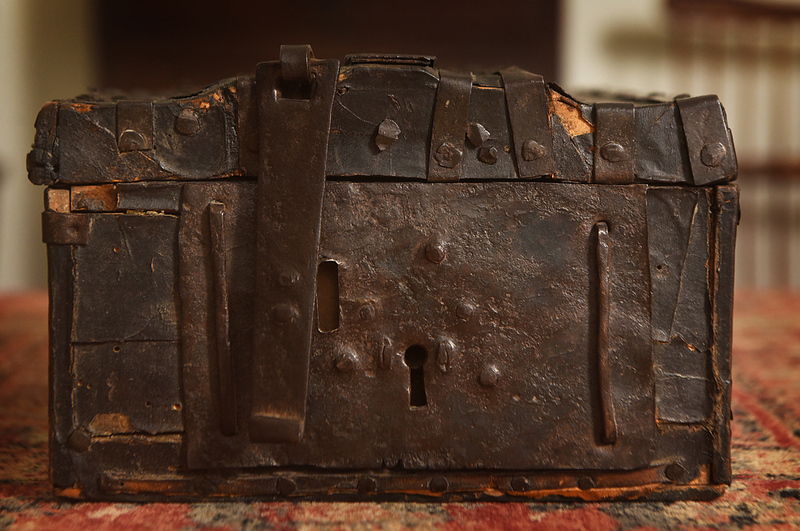 The outside is reinforced with iron fittings, hinges and a lock and originally it would also have had leather straps for carrying. The contents would have also been protected in the chest by a lining of red canvas, which survives still largely intact. While what it was designed to hold remains a mystery, it was likely to have originally contained a precious devotional book or religious texts, such as an illuminated Book of Hours, but may have also housed other materials like a rosary. The Bodleian, which can trace its roots to 1602 and is now the UK’s second-largest library after the British Library, has extensive holdings of early printed books. However, this is the first coffer to enter its collection. The library said it hopes that the coffer will help researchers, curators and visitors understand more about how items were stored, transported or used in the very early days of printing in Europe. Keeper of special collections at the Bodleian Libraries Dr Christopher Fletcher said: “The Bodleian collects books and manuscripts but also objects which helps us to understand the history and culture of the book – how they were kept, used, moved and understood. The Bodleian’s acquisition of the coffer was made with support from Art Fund, the Bodleian’s Kenneth Rose Fund and the Friends of the Bodleian. 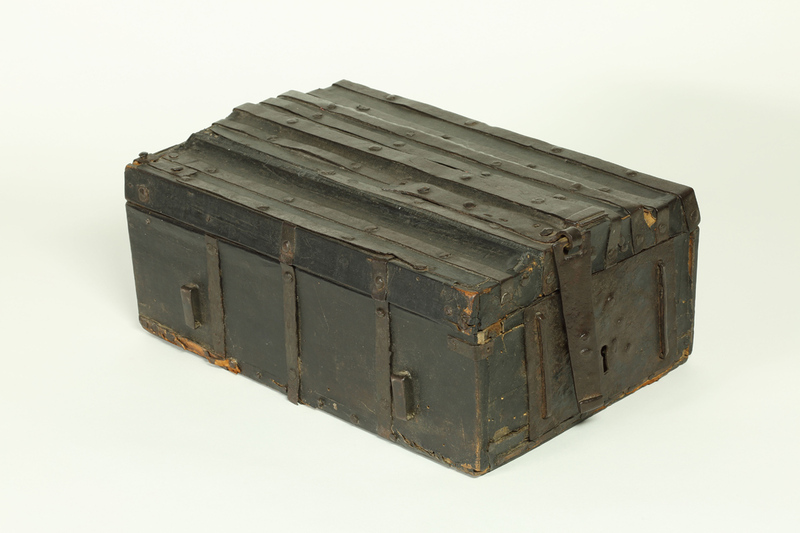 The Thinking Inside the Box display runs at the Bodleian’s Weston Library until 17 February. 3D modelling – the future of cataloguing? 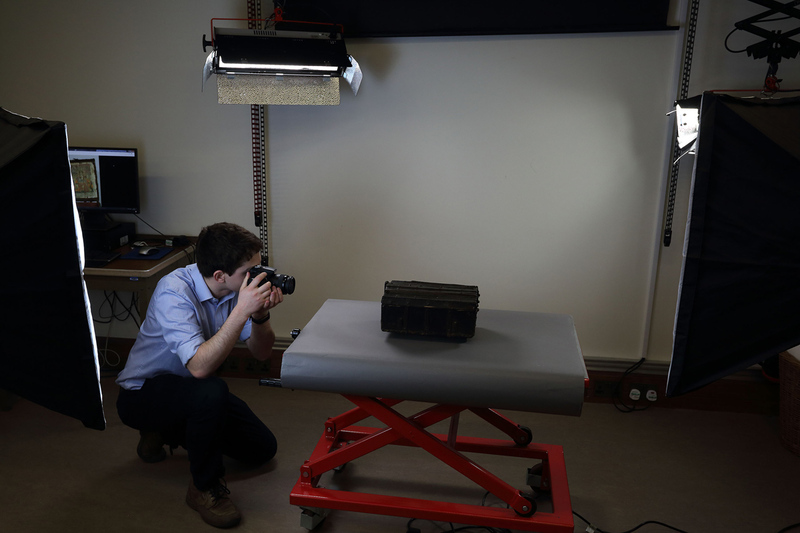 The Oxford Internet Institute’s ‘3D’ model of the coffer was created using photogrammetry. Essentially, multiple photographs of the object were taken from different angles to produce a ‘cloud’ of points, which then formed the basis of the ‘3D’ model. 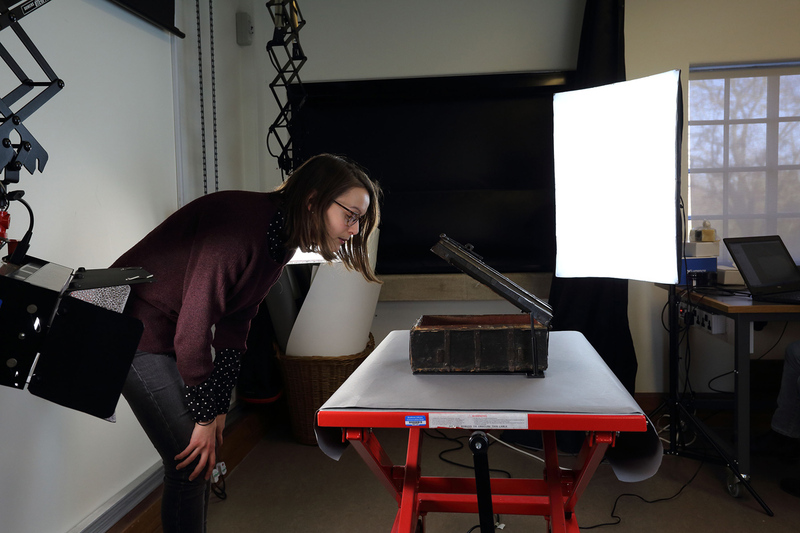 The model has been made available for viewing by the public via the Cabinet website – the Oxford’s new platform which is being developed to create a digitised version of the university’s museum collection to benefit teaching and research. 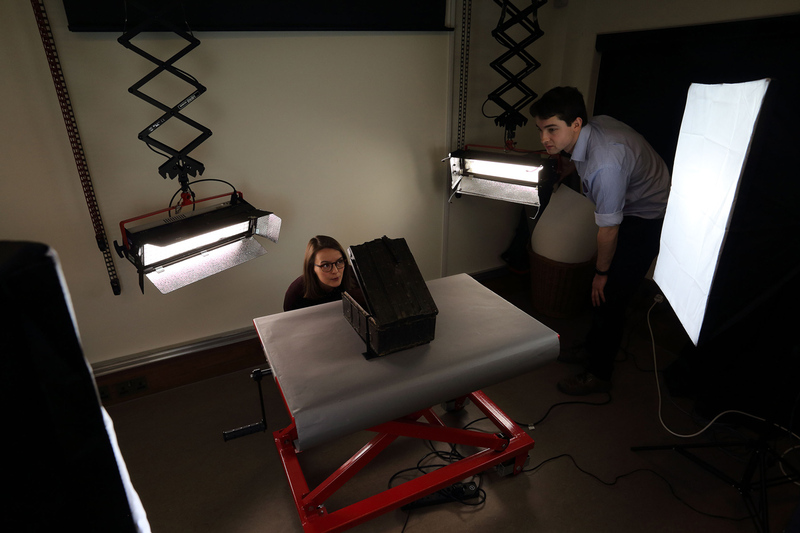 Members of the Oxford Internet Institute arranging the lighting in order to create the 3D model of the late medieval coffer. Image: Bodleian Libraries, University of Oxford. While the focus of the Cabinet project is educational, its development underlines the recent advancements made in this area which have already crossed over into the commercial world. A number of auctioneers, for example, have already adopted similar 360-degree modelling. Sotheby’s has released a series of ‘3D’ videos over the last two years to promote particular works, including a Canaletto consignment in early 2018, while jewellery and watch specialist Fellows now has a 360-degree viewing option for users on its website. The technology used to produce these images is becoming cheaper, smaller and simpler each year. One system observed by ATG involved items being placed on a turntable within a lightbox and then either videoed or rapidly photographed as they rotate. A version for flat art was also available. 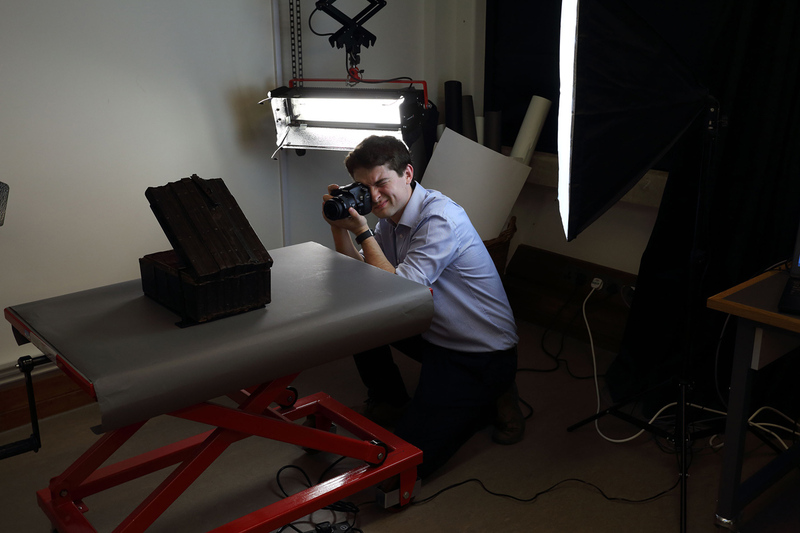 The digital files were then uploaded almost instantly to a connected laptop and a software package then used these recordings to produce a ‘3D’ model that can be embedded into the auctioneer’s online catalogue. Such systems have been used for some time in other markets, ranging from shoes to contemporary designer jewellery, but the benefits for potential bidders at art and antiques auctions or browsers of a dealer’s website are obvious – being able to view items in detail from all sides, getting a better sense of its proportions and assessing condition more fully. Potential benefits for auctioneers in particular could include fewer requests for condition reports and reducing photography costs. While the practicalities of using these techniques for large numbers of lots remain debateable for the moment, it would not be surprising if these approaches become more widespread for high-value lots over the next few years.